Netflix announced on Tuesday that Linux users may use the Firefox web browser on their devices now to watch video streams on the website. Netflix started to work on HTML5 compatibility almost four years ago to improve the service's compatibility. The video streaming service relied on the use of plugins, most notably Microsoft Silverlight in the early days, which limited compatibility with devices. Netflix with Silverlight is for instance only compatible with Windows and Mac Os X devices (if the Silverlight technology is installed on the device), while HMTL5 content is also available on Linux. 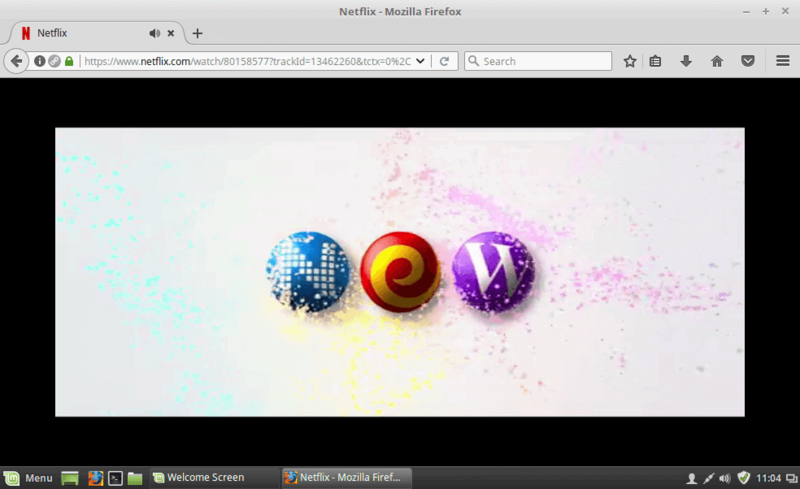 Linux users up until now could only use Google Chrome to watch Netflix on Linux. This changed recently according to Netflix, as recent versions of the Firefox web browser are supported now as well. Mozilla Firefox version 47 or later on Windows Vista or later, Mac OS X 10.7 or later, or Linux (Supported on stable, official release builds from Mozilla. Non-Mozilla builds are not supported). Note that Firefox will prompt you to allow the installation of its DRM module if you try to run Netflix in the browser on Linux. This is required, and canceling the prompt results in Netflix not working in the browser. Firefox uses the same DRM plugin that Google Chrome ships with. While Firefox support on Linux is a good thing for users of Linux, Netflix notes that its customer support won't assist uses with troubleshooting issues on Linux devices due to the "many configurations of Linux". The maximum resolutions are identical to the ones on Windows and Mac devices. Both Google Chrome and Mozilla Firefox support resolutions of up to 720p. Three browsers support higher resolutions, but they are not available on Linux. That is Safari and Internet Explorer with 1080p, and Microsoft Edge with 4K. Netflix notes that 4K streaming requires compatible hardware: a 4K display with a HDCP 2.2 compliant connection, and a 7th generation Intel cpu. Since Edge is only available on Windows 10, it requires that operating system as well. Good news for Netflix customers who want higher resolutions on other browsers. Netflix announced that it plans to bring higher resolutions, as well as Dolby Vision and HDR10 to other platforms as well. But this is just the beginning. We launched 4K Ultra HD on Microsoft Edge in December of 2016, and look forward to high-resolution video being available on more platforms soon. We are also looking ahead to HDR video. Netflix-supported TVs with Chromecast built-in—which use a version of our web player—already support Dolby Vision and HDR10. And we are working with our partners to provide similar support on other platforms over time. Now You: Do you stream videos online? Which service and browser do you use for that? > Do you stream videos online? Which service and browser do you use for that? This is due to the W3C, the governing body of web standards, standardizing a closed-source, proprietary form of DRM, as a concession to media companies. I guess Mozilla is offering it as an extension so that their default Linux install can be fully open source. Fyi, 4k or 4000p video is only optimized for TV screens of 50″ or above, ie on a 21″ desktop computer screen, there is no visual difference between 720p(= HD) and 4k videos. There is a visual difference. It doesn’t matter though for most people. I personally prefer 720 and 480p streams to save on bandwidth. Where a movie or show has superb detail that looks much better in full HD, which I think is rare, we’ll go to 1080p. Fyi, a video-streaming website that requires payment, eg monthly subscriptions, VOD and pay-per-view, has to buy or rent proprietary DRM encryption software licenses to protect their video contents from non-paying visitors. ……. The major DRM-protection software vendors are Google’s Widevine(= uses HTML5 = Chrome), M$’s Playready(= uses Silverlight = IE) and Adobe’s Primetime(= uses Flashplayer = esp Firefox). When Netflix began their business, they only paid for M$’s Playready(= required Silverlight and IE). A few years later, a richer Netflix added support for Google’s Widevine. Lately, they also added Adobe’s Primetime = can add more paying customers who prefer to use Firefox. > The major DRM-protection software vendors are Google’s Widevine(= uses HTML5 = Chrome), M$’s Playready(= uses Silverlight = IE) and Adobe’s Primetime(= uses Flashplayer = esp Firefox). My apologies. Yes, you are correct about Firefox and Adobe Primetime. ……. Seems, Google’s Widevine DRM software has gained market dominance over M$’s Playready and Adobe’s Primetime, just like Google’s Android mobile OS and Chrome browser. Would it be though? You’ve got to realize that a lot of people migrated to Linux to be more free of this proprietary / closed source nonsense. People like me would rather see that kind of stuff disappear altogether rather than find its way into Linux. Take this Netflix story as an example. Am I supposed to cheer Netflix for finally allowing Firefox+Linux users to access their service? It took them years to make this happen, not because of any technical impediment (Firefox+Linux users could already access Netflix “illegally” simply by changing Firefox’s user agent), but because of arbitrary demands by movie distributors. And now that Netflix has “allowed” Linux+Firefox (hooray…), they are still restricting 4K resolution to ONLY the Windows 10 operating system and ONLY the Microsoft Edge browser and ONLY the Intel Kaby Lake processor family. So no, I’m not particularly excited about this kind of nonsense polluting the Linux world more than it already has. Didn’t mean to pounce on you. :) I just wanted to show you that there are different perspectives on this issue. Simple considerations of convenience and market share are not important to everyone. Market reality determines software/app developer support for an OS platform. ……. Hence, both Linux desktop OS and Win 10 Mobile OS which have only a market-share of about 2%, are not widely supported by software/app developers because not much money could be made by developing software/apps for these two OS platforms. IOW, “follow the money”. Linux desktop OS is mostly developed and maintained/supported by ‘basement’ tech-geeks and hobbyists. ……. Linux desktop OS is in the doldrums mainly because it is not backed by a resourceful tech company = not well-supported by device manufacturers(in terms of drivers) and the OS is not very user-friendly(in terms of GUI) esp to computer dummies = minuscule market-share = not attractive to software/app developers = lack of popular, business and specialty software = no long term viability, eg many Linux distros have ceased to exist. ……. Hopefully, Google’s coming Fuchsia OS will dethrone M$’s Windows. Even though Win 10 Mobile has the backing of a resourceful tech company, it too is in the doldrums because it had to compete against an equally free rival, ie Google’s more open and customizable Android OS, and eventually lost out = minuscule market-share = lack of apps = no long term viability. Basically, it’s a chicken and egg situation and “the customer is king”(not Linux geeky/loner developers). Only the gaining of a sizable market-share of mass-consumers/users will lead to long term viability of an OS platform.